The Capital Iron Site, DcRu-116. Victoria Harbour. 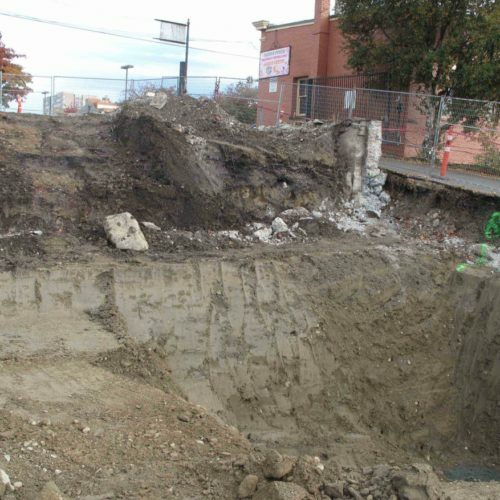 The remains of an ancient village, in the form of a shell midden, are located around the intersection of Store and Chatham Street off Victoria’s upper harbour. 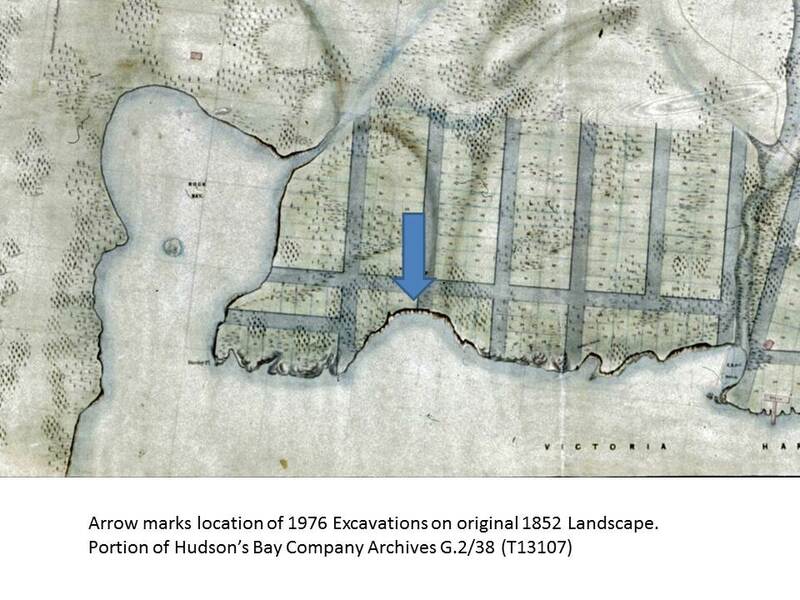 The site, listed as DcRu-116, was on a rocky bluff on the east side of the Harbour between the Johnson Street and Point Ellis (Bay Street) Bridges. This specific location on a rocky bluff with a good view up the Harbour would suggest the site was chosen for defensive purposes. Figure 1. Capital Iron building on the right foreground, 2017. Figure 2. 1976 excavation of pit 2 looking N.W. The author Grant Keddie taking measurements with Jim Pike of the Archaeology Branch. Tom Bown excavating. John McMurdo of the Archaeology Branch standing. Don Abbott Photograph. 1976. Figure 3. Excavation pits looking north. Ray Kenny and Bob Powell in unit 1. 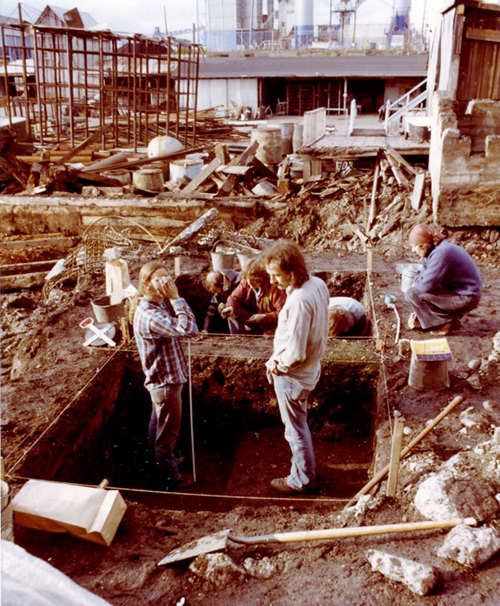 Jackie Cornford above second pit, with Grant Keddie, Jim Pike and Tom Bown excavating with trowels. Don Abbott Photograph. 1976. 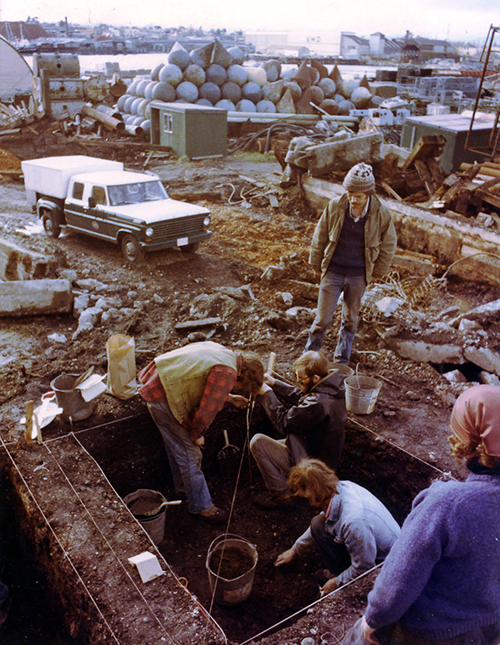 In 1976, buried shell midden was discovered during the removal of massive amounts of overburden for building a new facility next to the Capital Iron building at 1900 Store Street. On an emergency basis, volunteers from the (then) Provincial Museum and the Archaeology Branch spent the weekend of April 10-11 recovering information from this site. After removing over a meter and a half of disturbed overburden we encountered partially intact and then intact cultural material. We excavated to the base of the midden, which extended to a depth of 110cm, before we encounter non-cultural material below. Two excavation Units were each approximately 2 meters square and measured from the N.E. corner of the main building adjacent to the pits. Pit 1 was located North 8m – 9.8m and East 18m – 20m from the main datum. Pit 2 was located North 10.2m – 12m and East 18m – 20m. A 40cm bulk was left between the excavation pits (See figures 2-4). The midden extended north from the Capital Iron building for 24 meters, but was visible under Store Street for 40 m north of the main building. 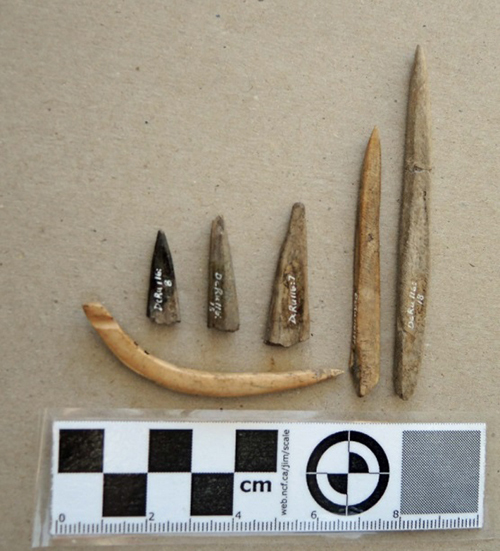 The upper levels of the excavation units were disturbed with a mixture of non-indigenous artifacts and older shell midden – especially in the first two levels. Excavation started in level one at 10-20cm. This level contained mixed historic materials – coal, glass, slag, window and bottle glass (one square green whiskey bottle with applied top), round headed copper nails, five square-headed cut iron nails and round thick headed nails and spikes. Level 2, at 20-30cm, contained smaller amounts of square nails, bottle glass and ceramics from the late 19th century. Level 3 at 30-40cm contained only one iron spike, a few square headed nails and portions of a few dark glass pantile based bottles. What was noticeable in level 5 (50-60cm) in Unit 1 and level 6 (60-70cm) in unit 2 was the large quantities of herring bones and scales. 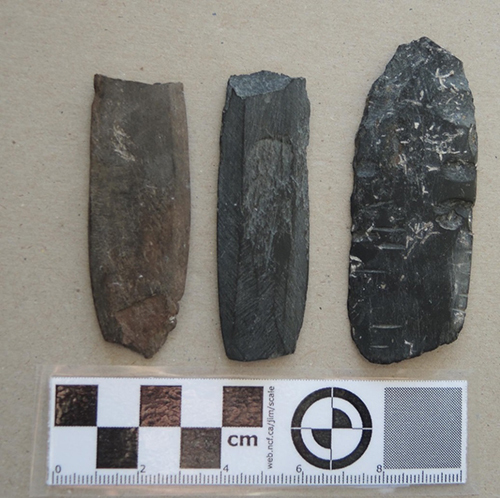 An occasional piece of burnt wood and a few square headed nails protruded into portions of level 5, but levels below to the base of the cultural deposits (80cm in Unit 2 and 120cm in Unit 1) were in tack. The predominant mollusks observed were native oyster with much smaller amounts of native little neck, butter, cockle and horse clams as well as bay mussel, whelks and barnacles. Figure 4. Looking east at two excavation units with cut soil profile below. Capital Iron building in background. Art Charlton, from the Archaeology Branch standing. Don Abbott Photograph. 1976. Figure 5. DcRu-116 location seen from the water. The Capital Iron Building is on the far left. Hope Point is on the Victoria West side on the far right. A water source was available for people living at this site from a creek that ran down the Haultain valley into Rock Bay to the North (see figure 6 & 7). 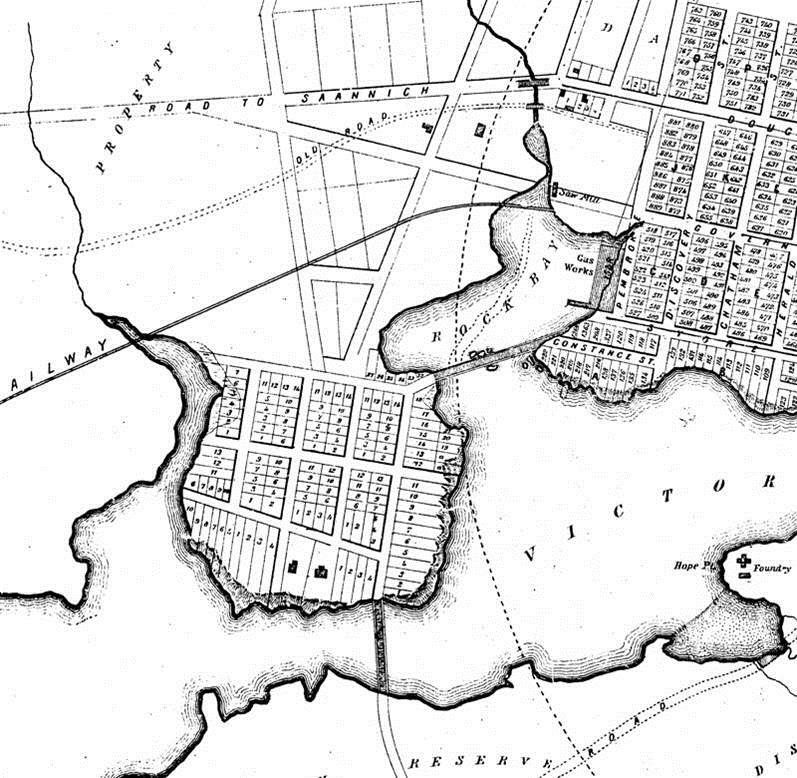 This can be seen in a portion of Joseph Pemberton’s 1852 detailed map of the west side of Victoria Harbour (figure 6). Many historic activities have altered the landscape in this area (see Appendix I). Figure 6. Site DcRu-116 seen on an 1852 map. Johnson Street Ravine on the right. Figure 7. Portion of 1863, map showing the relationship of site DcRu-116 to the upper harbour, Rock Bay and the south end of Selkirk Waters. 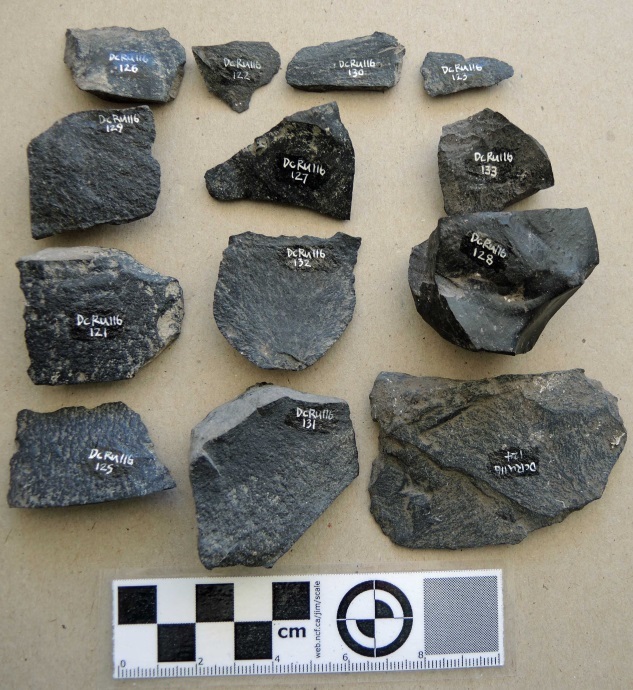 The charcoal sample I extracted from the lower intact deposits of this site was radio-carbon dated to an uncorrected date of 1690-+70 (Beta 59892). The Calendric Age is calBP: 1608+or-82. 68% range calBP: 1526-1690. Calendric Age cal:342+/-82. This would place the bottom deposits of the site in the calendar date range of around 260 to 424 A.D. There are few sites in the Victoria region that have dates in this time range. This period is missing in the large DcRu-12 shell midden on the Songhees Reserve in Esquimalt Harbor. There is, however, a partial overlap of the date range from the bottom of DcRu-116 with the bottom of the shell midden, DcRt-9, in Cadboro Bay which has a time range of 138 to 388 A.D. (Keddie- RIDDL571). There is also a partial overlap with the bottom of the main shell midden deposits at the large defensive site on Ash Point in Pedder Bay with a bottom range of 373-581 A.D.
Because of disturbed upper deposits I could not determine if this site was occupied in late pre-contact times. The small map, drawn by John Woolsey in 1859, (See Keddie page 46) shows houses as being “Songhees”. These could be construed as being in the area of shell midden, DcRu116, but the Woolsey map is not detailed enough to place the houses at this location with any certainty. There is no recorded tradition of a village at this location. There are 133 artifacts from this site. This assemblage includes artifacts recovered from an emergency excavation undertaken on the weekend of April 10 and 11th 1976, by staff from the Royal B.C. Museum and the Archaeology Branch. 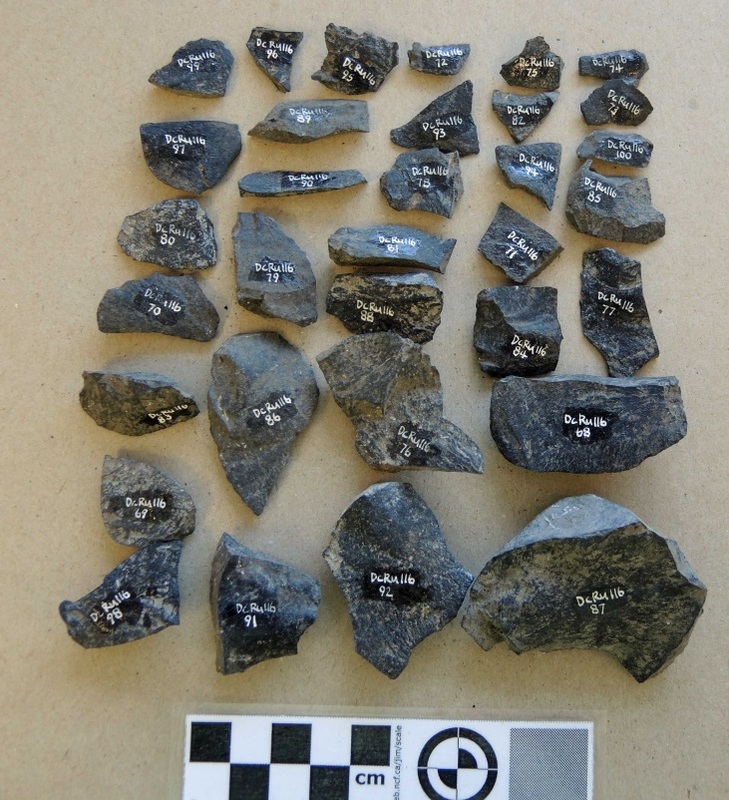 Nine of the artifacts were from disturbed surface midden deposits at the site and 30 artifacts were found in a large amount of shell midden mixed with other materials from this site that was dumped on April 9th at a location off Kimta Road in Victoria West. Tom Bown and I visited the latter location on a number of occasions to recover artifacts in the washed out material. I examined the excavation level bags, with their recorded site provenience, in November of 1992 and identified artifacts #59-132. There were two excavation units established with a 40cm wide bulk in between. Unit 1 or Pit 1 was located at North 8m-9.8m, East 18m-20m. Unit 2 or Pit 2 was located at North 10.2m-12m, East 18m-20m. Both were dug down to the bottom of the cultural material. The main datum and unit or sub-datums were the same at this site. The main datum was a point on the then existing building wall, with the two excavation units marked out in meters north from the wall. I intentionally made the main datum to be level with the N.W. corner of each excavation unit in order to make the depth of each of the units easily comparable. The artifacts are described here under classes and sub-classes that reflect different kinds of human behavior. The class Wealth, Status, Ceremonial is represented by only one artifact here. The class Subsistence is related to the procurement and processing of food. Tool Making refers to fabrication equipment that includes implements primarily used in the alteration or assembling of raw materials for use in the various stages of manufacture of other implements or equipment, and the waste material from these activities. This latter class includes the majority of the artifacts from this site. Figure 8.DcRu-116:67. Ground deer phalange artifact. DcRu-116:67. Shaped, deer phalange. Use unknown. This is a one-of-a-kind bone object. A deer phalange is heavily ground and tappers to the distal end. The proximal end of the bone is ground flat and the bone hollowed out. The open distal end is 0.5cm in diameter and ground around the edges. There is an intentionally made 0.3cm hole 0.5cm from the proximal base that has fractured into a larger hole. This could be part of some larger composite artifact or possibly a whistle if used with a reed. The fact that it is hollowed out would suggest that it was not intended to be used as a pendant, in which case it would likely have a notch around or a hole through the thin end. Provenience: N10-12 E18-20. DBD 40-50cm. DcRu-116:36. Dog canine tooth. This is not an artifact, as initially recorded. The nob-like structure on the proximal end is a natural root feature. Kimta Road midden. 4.2×1.1×0.7cm. Figure 9. 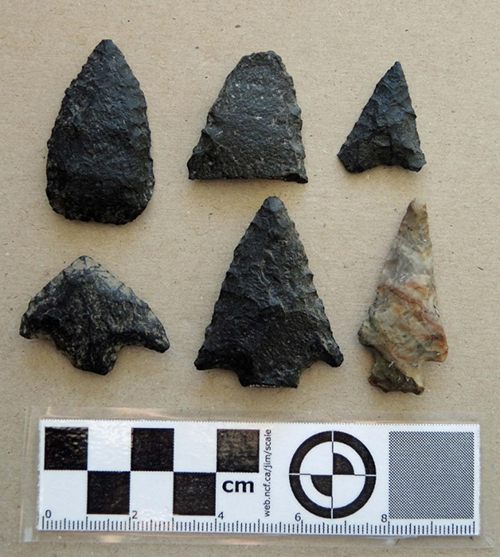 Projectile Points. Upper left to right: DcRu-116:40; 21; 52. Lower 58;1;44. DcRu-116:44. Projectile Point. Arrow Point. Mottled chert. Corner indented notches. Provenience: Kimta Road dumped midden.(4.6)x2.1×0.6cm. DcRu-116:52. Triangular biface. Point for arrow or small harpoon. Basalt. Small straight sided point with incurvate base and basal thinning. Provenience: Disturbed surface at Capital Iron. 2.90×1.96×0.49cm. DcRu-116:58. Projectile point. Point for a spear or harpoon. Basalt. Wide corner indented notches. Tip of tapering base broken off. Provenience: Kimta Road midden. 2.7×3.4×0.7cm. .
DcRu-116:40. Biface. Point for arrow or small harpoon. Basalt. Strait base and slightly excurvate sides. Provenience: Kimta Road midden. 4.35×2.5×0.7cm. DcRu-116:21. Unfinished biface. 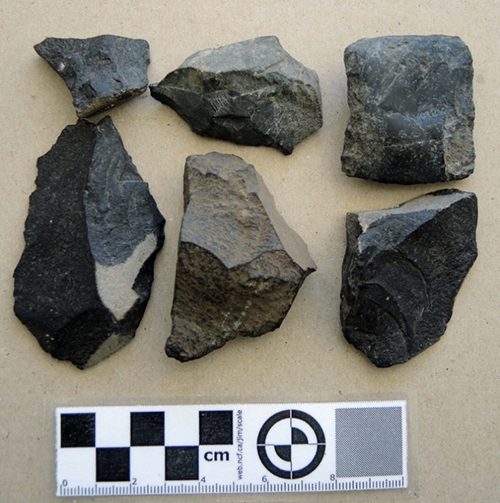 This is a basalt biface that appears to have been broken and discarded in the process of manufacture. Minimal bifacial flaking occurs on two sides. Straight sides. Provenience: N10.2-12/E18-20 (NE Quadrant) DBU 60-70cm. (3.1)x2.85×0.5cm. DcRu-116:1. Projectile Point. Spear or small harpoon point. Basalt. Corner indented notches. Tip of tapering base broken off. Provenience: N10.2-12/E18.11m. DBD 19cm. (4.4)x3.45×0.8cm. Sub-Class: Subsistence. Hunting. Sea Mammals. Ground slate Points. Figure 10. Portions of Ground Slate Points. DcRu-116:6;29;14. DcRu-116:6. Ground slate Point. Distal portion missing and small part of proximal end. Beveled edges. N11.65 E19.3m DBU 46cm. DcRu-116:29. Ground Slate Point. Flat proximal end. Portion of distal end missing. Beveled edges. Kimta Road Midden. (7.95)x2.3×0.5cm. DcRu-116:14. Ground Slate Point section. 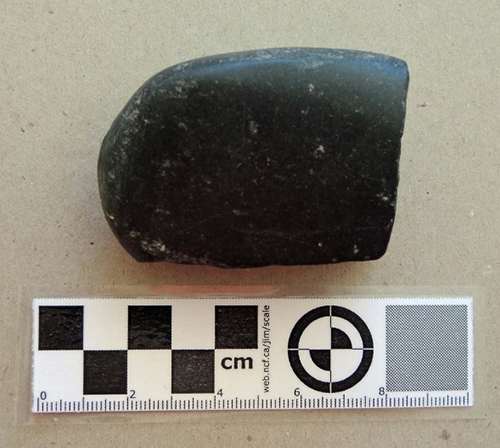 A longitudinal flat piece from the side of a slate point of a much larger size. A portion of the original ground edge is on one side. The original worked surface has 11 short cut marks and 4 ground short groves on its surface. Most of these are connected to the edge, but five short grooves are further in from the edge. N11.60 E19.92m DBD 60cm. Figure 11. Fishing related artifacts. DcRu-116:8;15;7;37;18. DcRu-116:56. Ground slate fish knife portion. No bevelled edges but the thin and very fine surface is most like finished fish slicing knifes. Disturbed surface. (5.18)x(4.75)x0.29. Figure 12. Portion of fish cutting knife. DcRu-116:57. Bone shank for composite trolling hook. Three small tying notched on proximal end. Groove on one side for tying bone hook on distal end. Kimta Road midden. 6.25×0.55×0.39cm. DcRu-116:18. (DcRu-116:19 is now part of this). Bone point. Small piece of proximal tip missing. N8.86 E19.6m. In ash lens. DBU 55cm. #19 portion found in screen and recorded at 60cm DBD. DcRu-116:37. Pointed bone object. Most likely a fish hook barb. 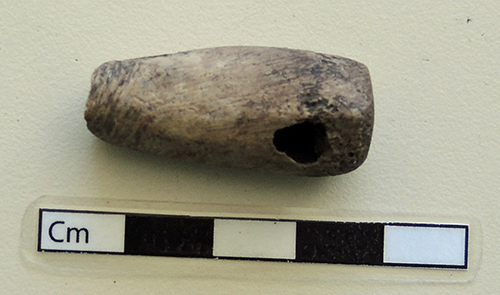 This is the broken end of a deer ulna bone tool that has been re-worked. Fractured on proximal end. Kimta Road midden. (6.4)x0.7×0.3cm. DcRu-116:7. Fragment of ground pointed bone artifact. Most likely a portion of a fish hook barb. N9.0 E19.90m Level III. (3.4)x1.1×0.4cm. DcRu-116:8. Fragment of ground pointed bone. Most likely a portion of a fish hook barb. N8.0-9.8 E18-20m. DBD 40cm. DcRu-116:13. Adze blade. Tapered cutting edge mostly on one side. Nephrite. N8.82 E 20.31 DBD 50cm. 6.5×4.85×1.1cm. DcRu-116:17. Adze blade. Portions of ends missing. Chlorite-like material. N8-9.8 E 18-20m. S.E. quadrant. DBD 51cm. (7.25)x4.1×1.15cm. DcRu-116:28. Adze blade fragment. Chlorite-like material. N10-12 E 18.21m. (4.7)x(2.25)x(1.3)cm. DcRu-116:12. Adze blade fragment. Chlorite-like material. Disturbed surface at Capital Iron. (4.4(x(1.6)x(0.8)cm. Figure 13. Adze Blade and blade portions. DcRu-116:12; 28;17;13. Sub-class: Fabrication Tools. Bone & Antler tools. DcRu-116:10. Antler tool. An antler wedge that has been sectioned and re-worked into a tapering point on the distal end. Could be used as a finer wedge or a fibre fabricating tool. Disturbed surface at Capital Iron. 12.1×2.3×1.7cm. DcRu-116:26. Possible worked bone object. Mammal leg bone splinter. Water worn. May have extra use wear on one end. N 9.74 E18.33m DBD 84cm. 7.9×1.85×0.4cm. DcRu-116:51. Spatula-like bone tool fragment. Use unknown. Heavily ground mammal rib with one end nearly complete, but split longitudinally along one side. Likely the proximal end of the unknown object. Kimta Road midden. (4.37)x(1.35)x(0.27)cm. DcRu-116:35. Distal end of deer Ulna tool. Ground to pointed rounded tip. Kimta Road midden. (8.0)x1.4×0.3cm. DcRu-116:9. 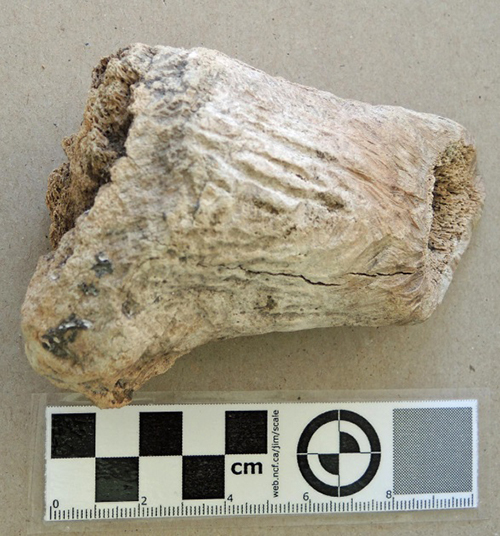 Mid-section of the distal end of a deer ulna tool. N8.32 E20.35. DBD 40cm. (4.1)x1.9×0.7cm. DcRu-116:101. Broken portion of a ground bone tool that has been graved to remove a section for other uses. N8-18m E18-20. DBD 0.50-0.60m. 3.8×1.5x.07cm. Sub-class: Fabrication Tools. Abrading stones. Figure 15. Abrading stones. DcRu-116:24;27;133;3;22. Figure 16. Ground stone beach cobble. DcRu-116:25. DcRu-116:3. Abrading stone. Shale-like material. Portion of one end missing. Rectangular. Ground on both surfaces and sides, but very fine surface on one side with two shallow grooved areas. N8.408.55 E18.0-18.12. DBD 16cm. (14.3)x7.6×1.35cm. DcRu-116:24. Abrading stone. Sandstone. Portion of one end missing. In tan-brown ash. Rectangular. Ground smooth on both flat surfaces and sides. N9.65 E19.48. DBD 77cm. (10.7)x5.1×1.4cm. DcRu-116:27. Abrading stone fragment. Sandstone. Ground on both surfaces. N10-12 E19.15. DBD 80cm. (6.35)x(4.65)x2.7cm. DcRu-116:22. Abrading stone fragment. Sandstone. Ground on both surfaces. N11.64 E19.55. DBD 64cm. (6.2)x(5.5)x1.5cm. DcRu-116:133. Shaped abrader fragment. Ground on both surfaces and side. Kimta Road dumped material. (5.2)x(4.3)x1.6)cm. DcRu-116:25. Ground portion of beach pebble. This was originally a naturally flattened and round edged cobble that was fractured into a few pieces. 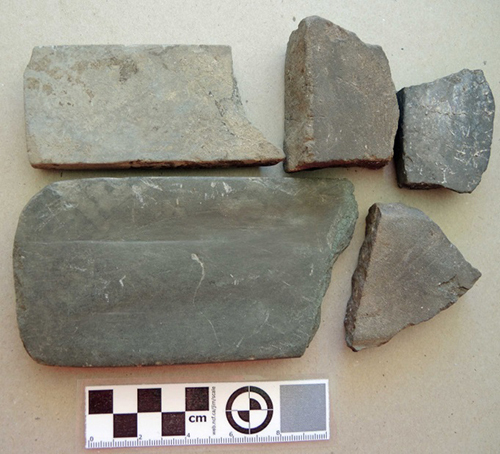 It may have been a larger complete ground cobble artifact that was broken. However, wear patterns extend over the two fractured edges showing that the stone was used after the original stone was fractured into portions. There is heavy grinding, mostly on one larger surface, of the portion of the original cobble that remains. The long side and to a lesser extent, the shorter end have been ground. There are numerous very fine scratches in all directions on the two smoothed and polished surfaces of this cobble. Its function is unknown, but it could be a rubbing stone for rubbing substances into and compressing wood, such as various practices in treating canoes. Provenience: N9.08 E.18.40. DBD79cm. (6.8)x(4.6)x(2.3). DcRu-116:23. Hammer stone. Elongate coarse sandstone cobble, pecking on one end. Provenience: N8-9.0 E18-20m. DBD 65-70cm. In ash, crushed shell and dark brown soil. 9.4×5.1×3.8cm. Figure 17. DcRu-116:23. Sandstone Hammer. Sub-class: Fabrication Tools. Worked stone flakes. DcRu-116:20. Retouched stone Flake. One long side and the distal end of this flake are intentionally retouched to create a special use edge. This could have been used for shaving hard wood. N9-9.8 E19-20. DBD 60-68cm. 3.8×2.15×0.65cm. DcRu-116:16. Use retouched flake. Fine grained grey chert. Tiny flaking on two edges suggest this may have been used as a scrapping tool. Given that it was found on the surface the damage on the fine edges could be a result of recent crushing. Provenience: Surface at the Capital Iron site. 3.9×2.8×1.15cm. DcRu-116:41. Use retouched flake. A few areas of tiny flaking suggest this fine dacite flake may have been used as a scrapping tool. Provenience: Kimta Road midden.4.2×3.4×1.1cm. DcRu-116:5. Flake with bifacial flaking on one side. Basalt. 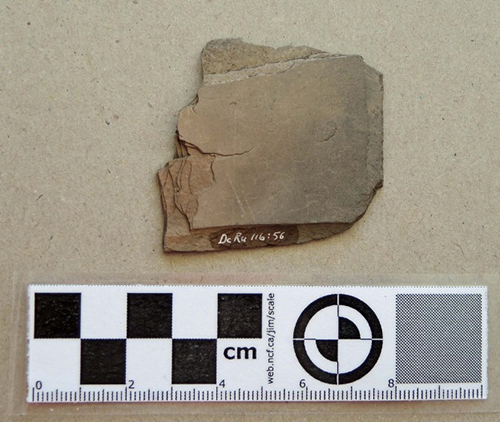 This is likely a flake fractured off a larger piece in an attempt to make a projectile point. N10.23 E19.20. DBD 38cm. 3.5×2.5×1.1cm. Figure 19. Worked elk antler debitage. DcRu-116:32. DcRu-116:32. Antler. The base portion of an elk antler that has been chopped off and subsequently chewed by rodents. Disturbed surface deposits at Capital Iron. 10.4×7.7×4.1cm. In urban areas, fine grained rocks crushed by machinery can be found scattered about, especially when used on pathways and fill around houses and in cement structures. It is not uncommon in this environment to find what falsely appear to be ancient flakes or cores discarded in tool manufacture. 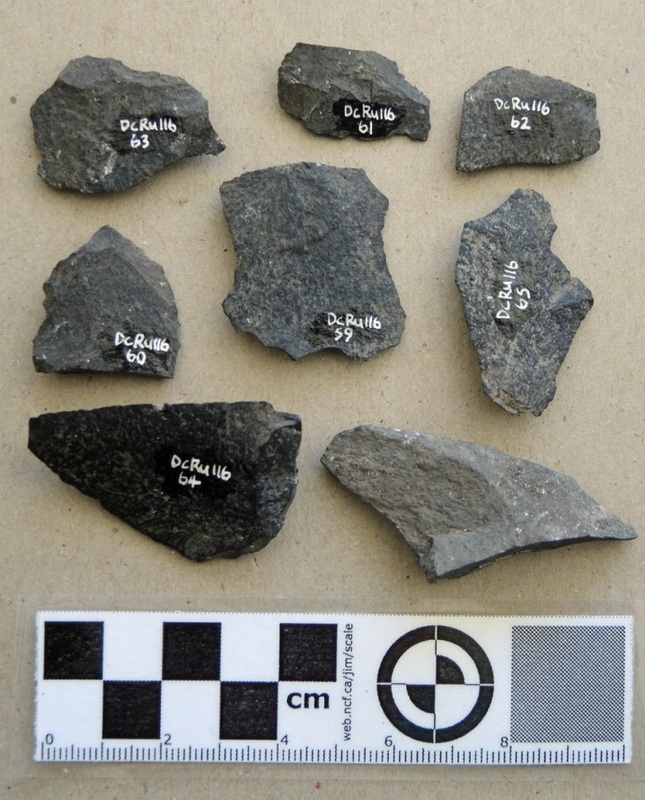 Since many of the items described here are from disturbed deposits – that is midden mixed with other material of unknown origin – we need to be cautious that some may be of more recent non-First Nations activity. Many of the flakes do have an old surface patina demonstrating that they are ancient. I have included two that I have determined are of a recent nature – numbers 11 and 30. Artifact no. 11 was found in the 0-30cm level of unit 2 – indicating some historic disturbance in this upper level. From my own experience of collecting and flaking many thousands of stones from many sources in the greater Victoria Region, I am able to observe there are what I would call field cobbles and beach cobbles. Where the original outside cortex of the flaked basalt is present, field cobbles have a duller and mottled heavy patina on the outer surface as opposed to beach or stream cobbles which have smoothed surfaces and less evident outside patina. DcRu-16:49 and DcRu-116:46 are examples of the latter types. X-ray analysis is needed to see if these types have any compositional differences. 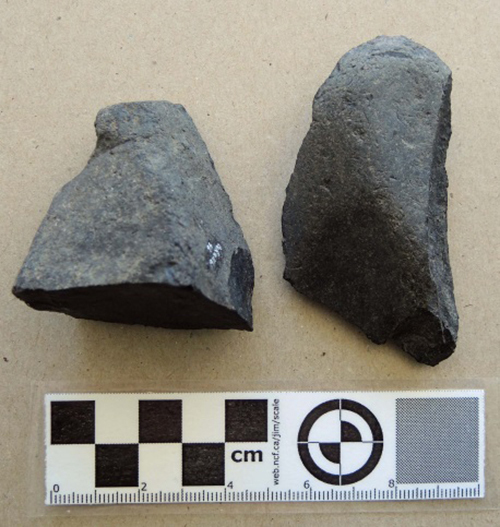 One item, DcRu-116:128, is not flaked, but is a fire-exploded cubicle piece of fine basalt or dacite that may have been intentionally heat treated and intended as a core of raw material. DcRu-116:46. Basalt Core segment. Original cortex on two sides. Field basalt based on surface texture. Kimta road dumped midden. 5.66×4.40×3.6cm. Figure 20. Two types of surface texture. Mottled surface of field cobble (DcRu-116:46) on left and smoother surface beach cobble (DcRu-116:49. Figure 21. Flakes with original cortex surface. DcRu-116:54:47:45:43:50:55. DcRu-116:49. Basalt Flake with cortex on one side. Beach cobble based on surface texture. Kimta road dumped midden. 7.6×3.8×1.9cm. DcRu-116:54. Flake with original cortical surface on one edge. Kimta Road midden. 3.4×2.7×1.3. DcRu-116:45. This is a section of a cobble that has been formed by bi-polar percussion – that is, smashing one end of the cobble while the other end rests on a stone anvil. It is a very hard chert-like material. Kimta Road midden. DcRu-116:47. Flake with most of the original cortical surface on one side. 5.16×3.36×1.35cm. Kimta Road midden. DcRu-116:43. Large flake of basalt. Some original cortical surface. 7.4×4.1×1.1cm. 6.11×4.00×1.61. Kimta Road midden. DcRu-116:50. Core segment with remnants of the original cortical surface remaining on one end. Provenience: Kimta Road midden. DcRu-116:55. Large flake of basalt. Some original cortical surface remaining on one end and in small amounts of two thin edges. 4.6×4.1×1.8. Kimta Road midden. DcRu-116:2. Basalt core segment. N 8.52m E18.19m. Upper level. 4.85×4.0x1.5cm. DcRu-116:42. Basalt flake. Some recent edge crushing. 3.9cmx2.8cmx0.5cm. DcRu-116:48. Basalt flake. Some recent edge crushing. DcRu-116:53. Basalt flake. Some recent edge crushing. DcRu-116:4. Small percussion flake that likely came off a core with the removal of larger flakes. Although it has a similar size as some micro-blades, it is not a pressure flaked micro-blade. Surface at Capital Iron site. 1.25×0.8×0.25cm. List of Debitage within the DcRu-116:59-133 range. In 1992, I extracted the following artifacts from the 1976 excavation level bags that were labelled as to provenience in the excavation units. 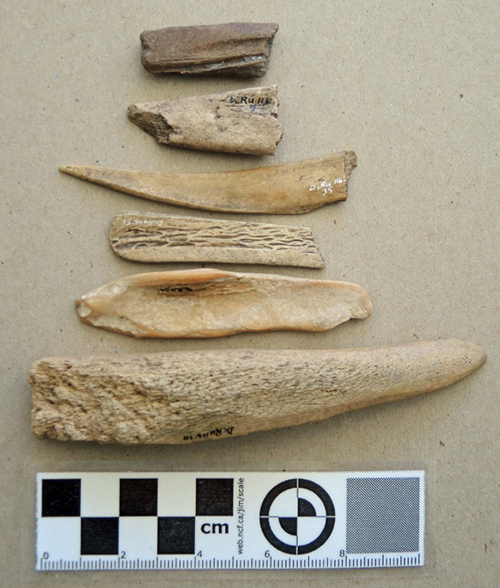 Exceptions are numbers 129-132 from the Kimta Road midden that were originally lumped together as #49. 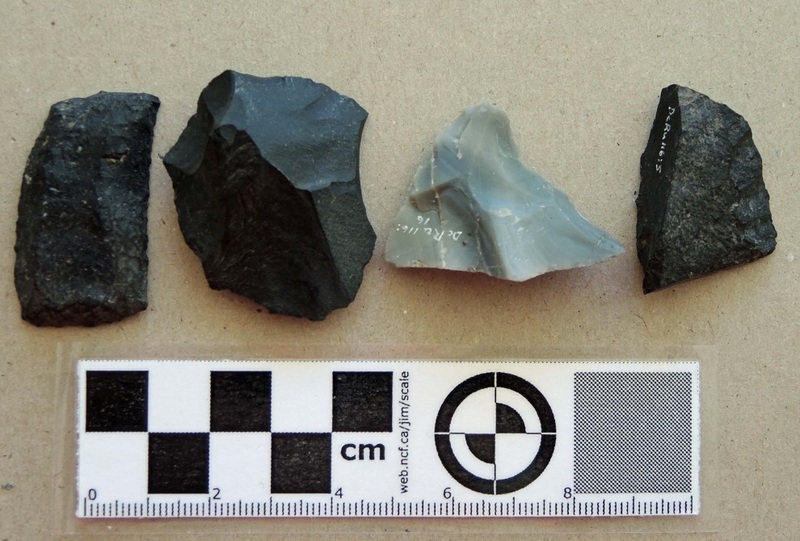 Measurements are not given, as anyone undertaking lithic analysis would want to measure the artifacts in a prescribed way and develop more specific descriptions of flake morphology. The majority of these are basalt, andesite and other volcanic rocks. DcRu-116:64-65(Pit 1,Level 1, 10-20cm); DcRu-116:60(Pit 1, Lev. 3, 30-40cm); DcRu-116:66-67 (Pit 1, Lev. 4, 40-50cm); DcRu-116:101-107 (Pit 1, Lev. 5, 50-60cm); DcRu-116:59&76-88 (Pit 1, Lev. 6, 60-70cm); DcRu-116:121-127 (Pit 1, Lev. 7, 70-80cm); DcRu-116:117-120 (Pit 1, Lev. 8, 80-90cm); DcRu-116:89-90 (Pit 1, Lev. 10, 100-110cm). DcRu-116:100&128 (Pit 2, Lev. 2, 20-30cm); DcRu-116:61-63 (Pit 2, Lev. 3, 30-40cm); DcRu-116:68-75&133 (Pit 2, Lev. 4, 40-50cm); DcRu-116:91-99 (Pit 2, Lev. 6, 60-70cm); DcRu-116:108-116 (Pit 2, Lev. 7, 70-80cm). Figure 26. Stone Debitage. DcRu-116:4; 102-119. Figure 27. Basalt core or raw material. DcRu-116:38. DcRu-116:38. Basalt core or raw material. Large five sided core of coarse grained basalt. Flakes are fractured from two faces resulting from single impact point on the corner of one side. 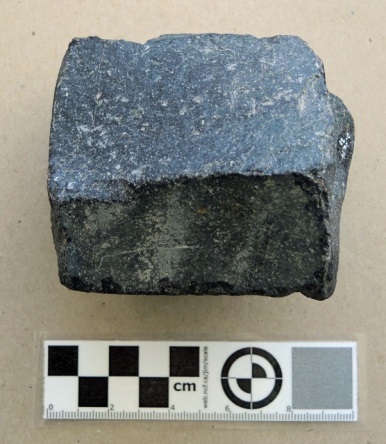 This could be a raw material sample that was tested by removing a flake or a piece of unworked raw material brought to the site in ancient times and subsequently struck once by modern machinery while being dug up. Kimta road dumped midden. 9.3×9.2×6.8cm. 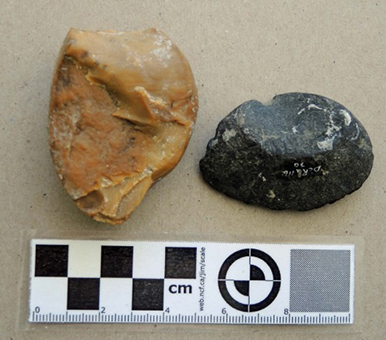 Two stone artifacts are of a recent nature. DcRu-116:11 is a section of a quartzite cobble that has been formed by heavy bi-polar percussion. It was found in a disturbed level with historic materials. Modern commercial cement is still adhering to the rock. This appears to be a mechanically crushed rock that was inside a cement structure. N10-12 E18-20.DBD 0-30cm. 5.9×4.5×1.8cm. 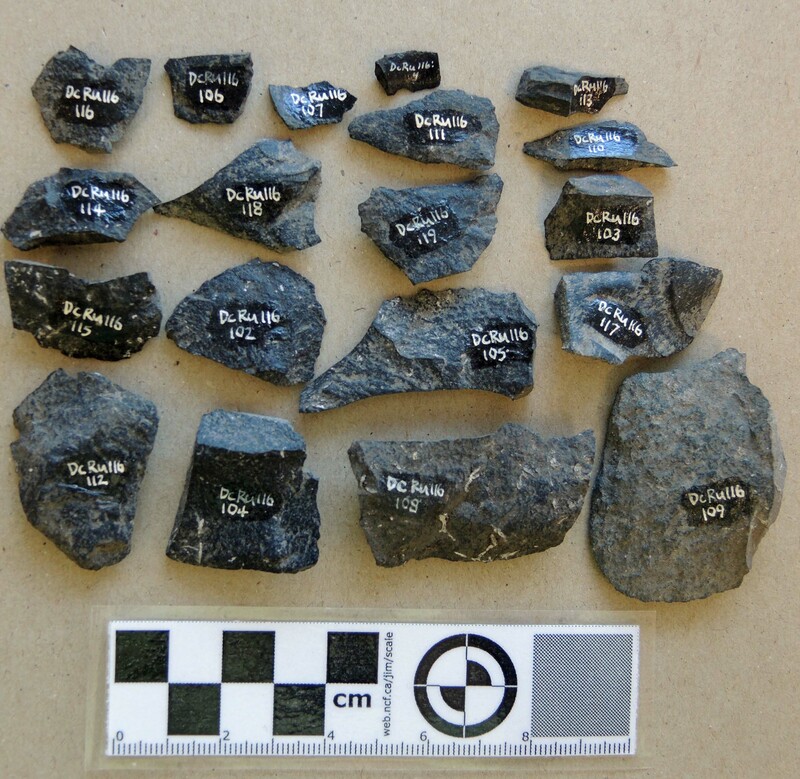 DcRu-116:30 is a small spall off of a large cobble that was removed with enormous force. 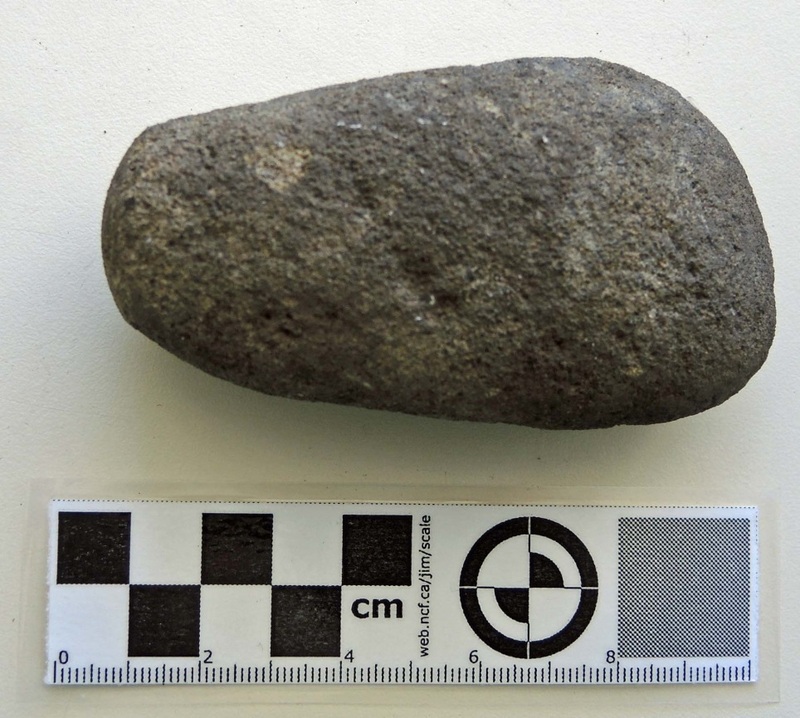 Although spall tool artifacts are occasionally found in ancient sites, this one exhibits a large secondary outside spall and a crushed point of impact which is typical of recent machine crushed rock. Figure 28. DcRu-116:11 & 30. Modern machine crushed pebbles. Provenience: Kimta Road midden. 5.6×4.75×1.5cm. In March of 1991, I observed shell midden at the west end of the parking lot located at the S.W. corner of Store and Chatham Streets. It had been exposed by large truck ruts. I observed a nephrite adze blade found by a private citizen at this location. The 9.5cm long adze blade had a cutting edge that was beveled mostly on one side with a slight bevel on the other. It measured 6cm across the cutting end and 3.4cm across the poll end. It was thickest, 1.4cm, near the cutting end and 1.2cm thick at the poll end. Observations of DcRu-116 in 2014. 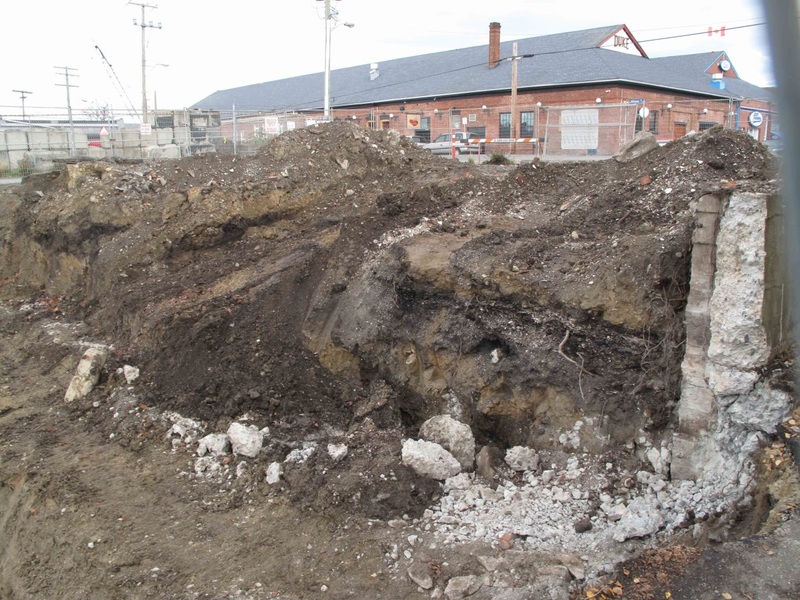 Midden deposits were found underneath a small building on Store Street when it was being torn down in 2014. This location was to the north of the 1976 excavation area. On November 20, 2014 I visited the site to examine and photograph the exposed shell midden. 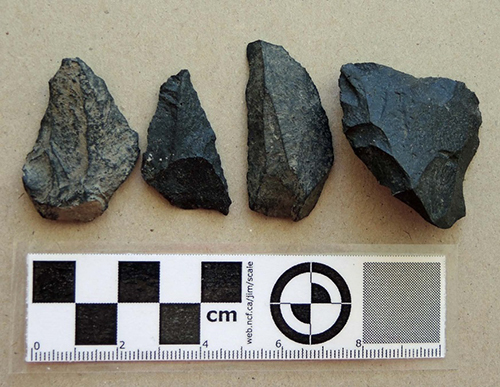 The upper portions of the midden were disturbed by historic non-First Nations activity, but the southern lower portions were intact. Figure 29. Midden above non-cultural deposits. The cement wall on the left formed the south boundary of the building that was torn down. Midden was contained in this area and not visible under the roadway immediately adjacent to it on the south side. Grant Keddie photograph, August 28, 2014. Figure 30. 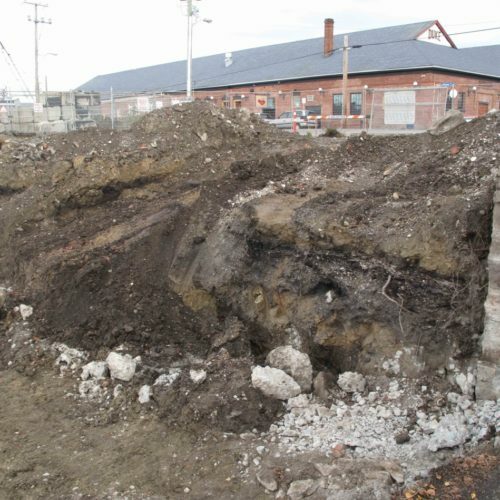 Exposed midden under the south side of the small building removed in 2014. Grant Keddie photograph, August 28, 2014. Figure 31. 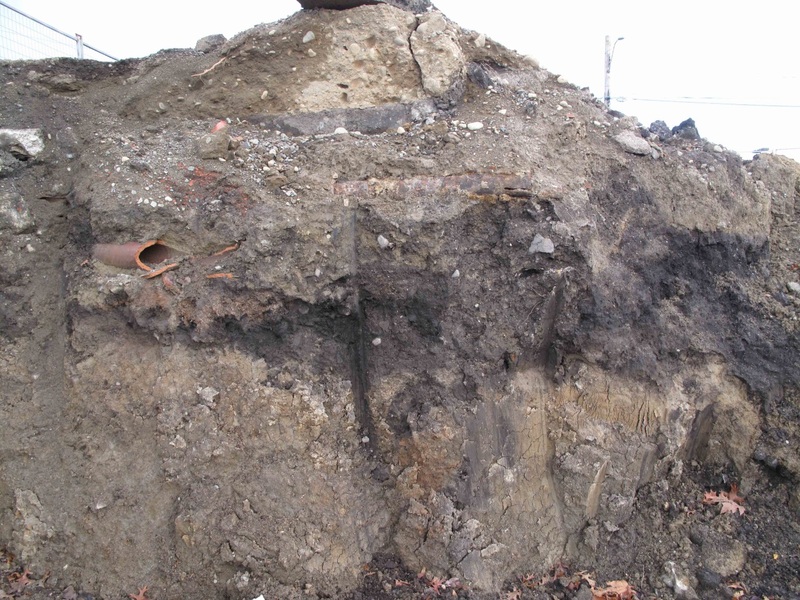 North end of exposed midden seen in figure 30. This area is disturbed down to near the bottom. Grant Keddie photograph, August 28, 2014. Figure 32. 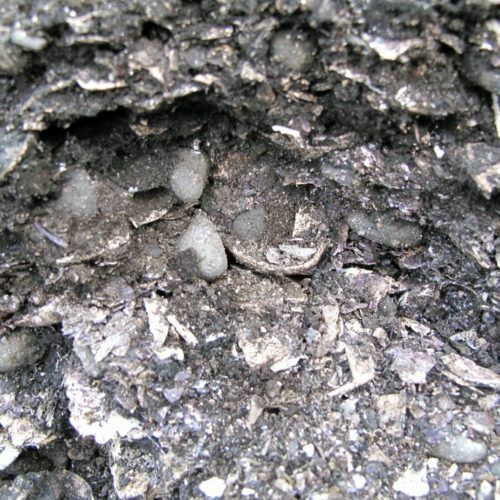 Close up of intact shell midden near bottom of the midden just to the north of the southern cement wall. Grant Keddie photograph August 28, 2014. 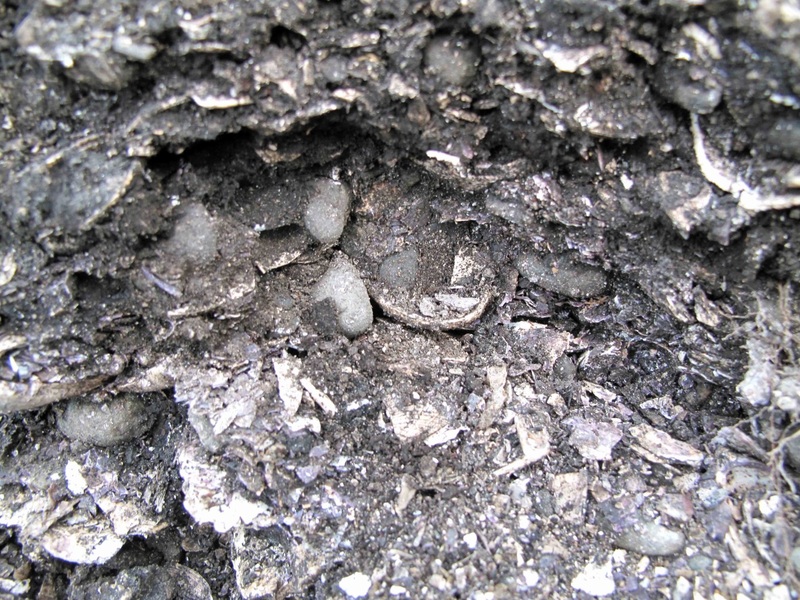 Figure 32, shows a close-up of the shell midden which is composed mostly of native oyster shell. In a close examination of the exposed midden, I observed many small weathered beach pebbles (1-3cm) mixed in with the shell fish remains. There are no local inner harbour beaches that could be the source of these small pebbles. They are similar to the small pebbles that one often observes entangled in the roots of the Bull kelp (Nereocystis luetkeana), that has been pulled up either by storms or by people. 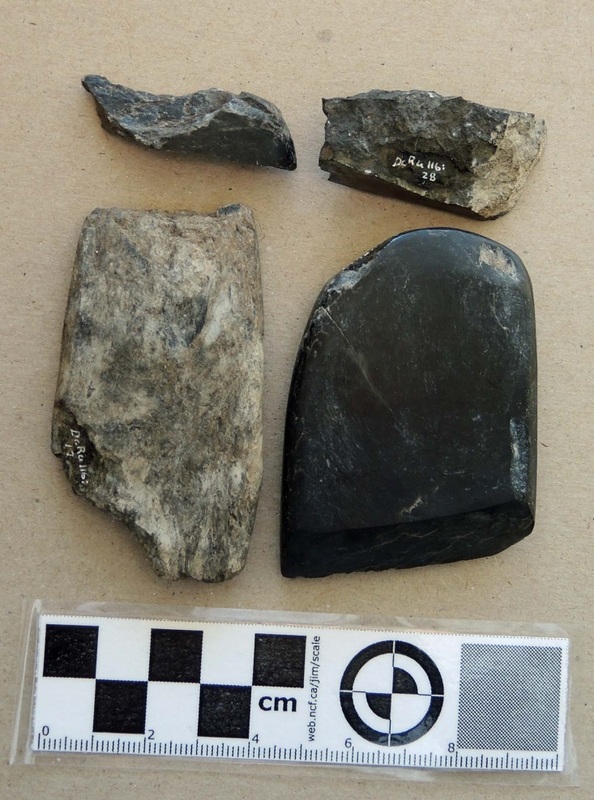 I would suggest that these pebbles came to this site when First Nations brought large canoe loads of kelp that they processed on the site for making a variety of items. The long stalks of Bull kelp were dried and cured, and spliced or plaited together to make ropes, nets, and fishing, harpoon and anchor lines. Kelp bulbs were also used for liquid storage and for steam bending wooden fish hooks. In 2014, Stantec undertook archaeological work on the site under alteration Permit 2014-0300. 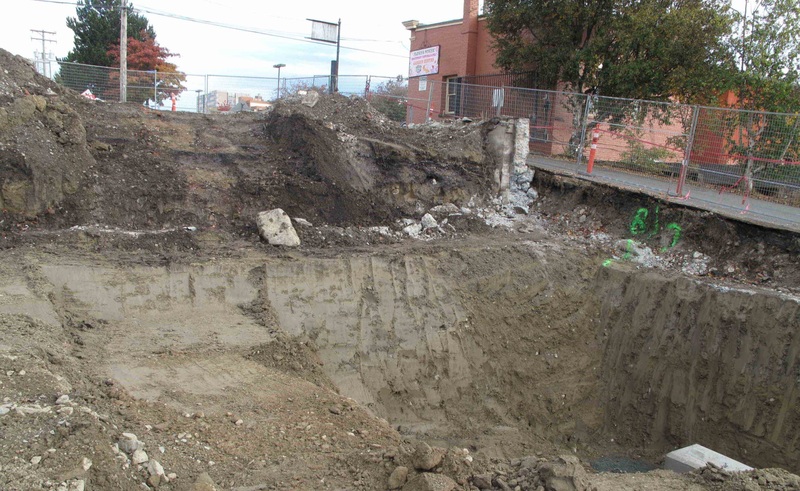 This work resulted in the removal of the last of the shell midden from the west side of Store Street. Figure 33. Stantec monitoring removal of Midden. Tom Bown photograph October 31, 2014. Figure 34. Site location after archaeological monitoring and removal of cultural material. Grant Keddie photograph December 3, 2014. The Capital Iron site, DcRu-116, is one of only three pre-contact archaeological sites in Victoria’s Inner Harbour. The other two are located on rocky bluff peninsulas at Raymur Point and Lime Point across from each other near the entrance to the inner harbour. The Lime Point site dating between 600 and 1200 years old is a known defensive site – having once had a trench embankment dug around the back end of the peninsula. The Capital Iron site was first occupied earlier around 260A.D. to 424 A.D. It is likely that the location of the Capital Iron site was chosen for both economic reasons and its defensive features – being high above the beach with a good view of the harbour. Modern development has now destroyed all of the Lime Point site and most of the Raymur Point site. DcRu-116 has been heavily impacted by historic activities. The recovery of information has been piecemeal but has begun to build a story of the human activities that occurred here in the past. The recovery of more information from any intact midden will help to build a more complete picture. Future archaeological work at DcRu-116. The shell midden is now mostly or all gone from the west side of Store Street on the property around the Capital Iron Buildings. The low areas near the water are landfill on a previous embayment that will not contain any intact midden. Portions of site DcRu-116 are known to exist under Store Street east of the Capital Iron buildings and extending, at least, onto the parking lot at the S.E. corner of Chatham and Store Streets. If some of this midden is still in-tact, it will be important to recover an adequate faunal sample that was not recovered in the 1976 excavations due to the rushed emergency nature of that project and also to get more radio carbon dates to provide a better time frame as to when the site was occupied. 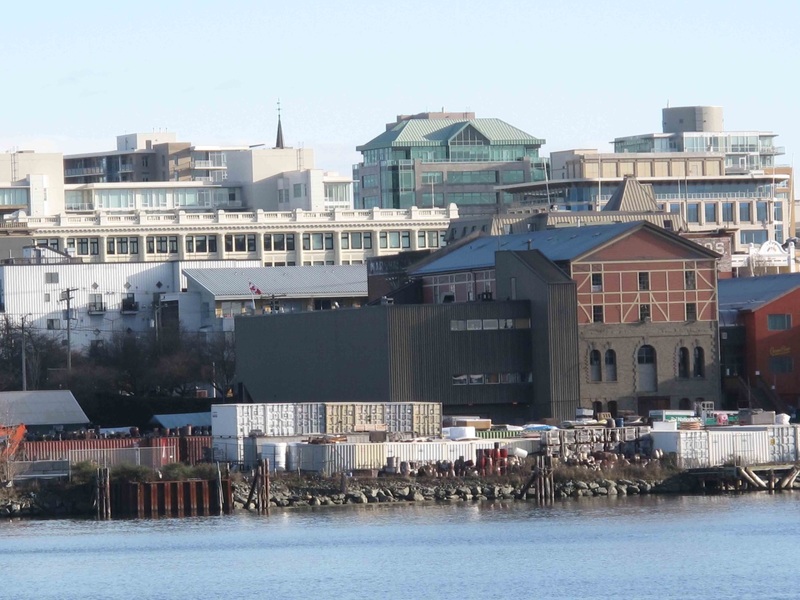 This site has the potential to be a valuable source of information on the history of Lekwungen peoples and their use of Victoria Harbour. Lot 114 adjacent to the south of the excavation area was owned by a J. Crow in 1861 (Victoria Archive tax assessment records). 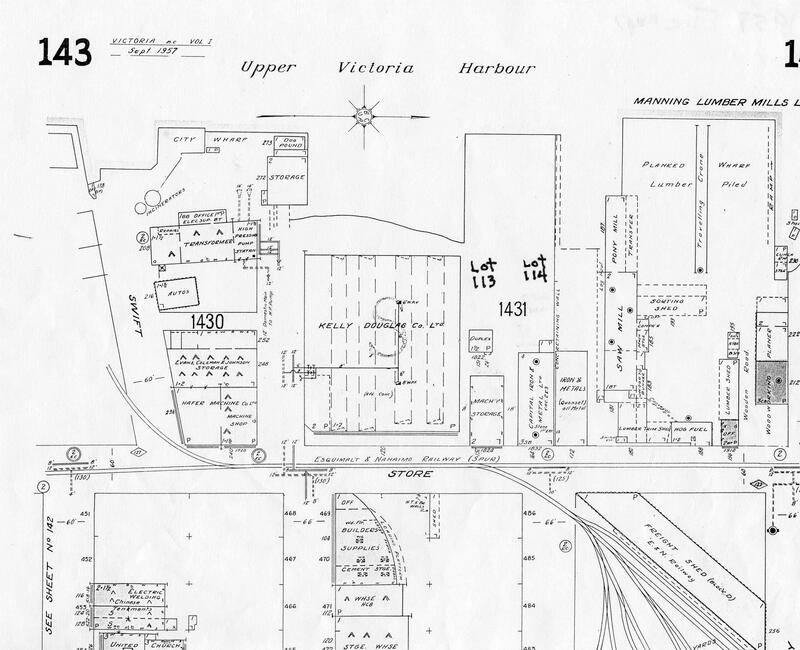 Extensive activities, modifying the landscape began in this area with the building of the two story stone warehouse of Dickson and Campbell & Co. on lot 114, with a wharf and other buildings adjacent (they later bought lot 113). The three foot thick walls were “built of granite, blasted from the adjoining primeval rock” (Colonist October 31, 1862 & September 8, 1863). Figure 35. The Dickson and Campbell & Co building (later the Capital Iron building) on the far right in 1863. In 1885, the location had become the Mount Royal Milling and Manufacturing Co. on lot 113 (two floors added) and Joseph D. Pemberton’s Royal Milling and Manufacturing Co. on lot 114. These properties later became part of the Capital Iron and Metal Company property at 1900 Store Street (an earlier address was 1832 Store Street). 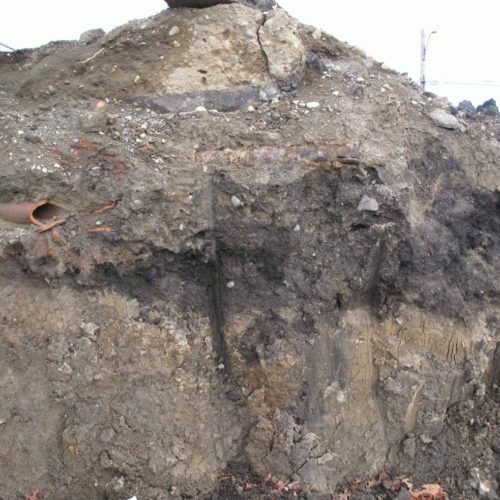 It is likely that some intact midden still exists beneath Store Street and extending onto the properties east of Store Street on both sides of Chatham Street. Less disturbance of the landscape has occurred in the past on the south side of Chatham. I observed shell midden at this parking lot location in the 1970s when some shallow bulldozing activity was undertaken. A private citizen found a stone nephrite adze blade for a work working tool in exposed shell midden at this location. On the north side of Chatham Street extensive disturbance occurred beginning in 1862, with development of the Albion Iron Works facilities. 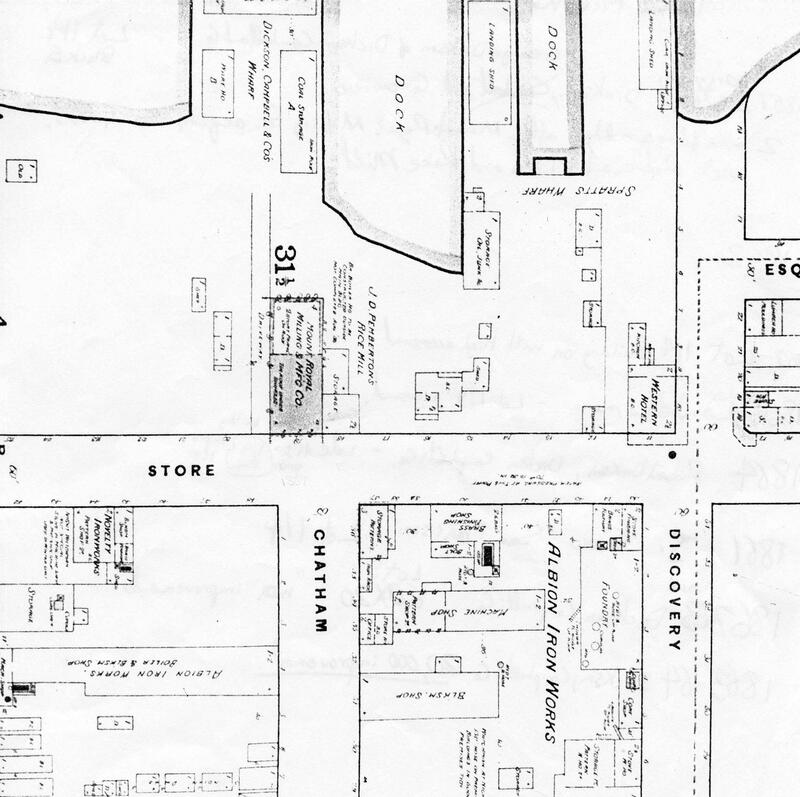 This included Foundry buildings, machine shops and a sequence of other buildings (see 1885 Fire Map for later changes). Figure 36. 1885 Fire Map. After the Iron works closed the railway was extended into this area (see 1957 Fire Map). 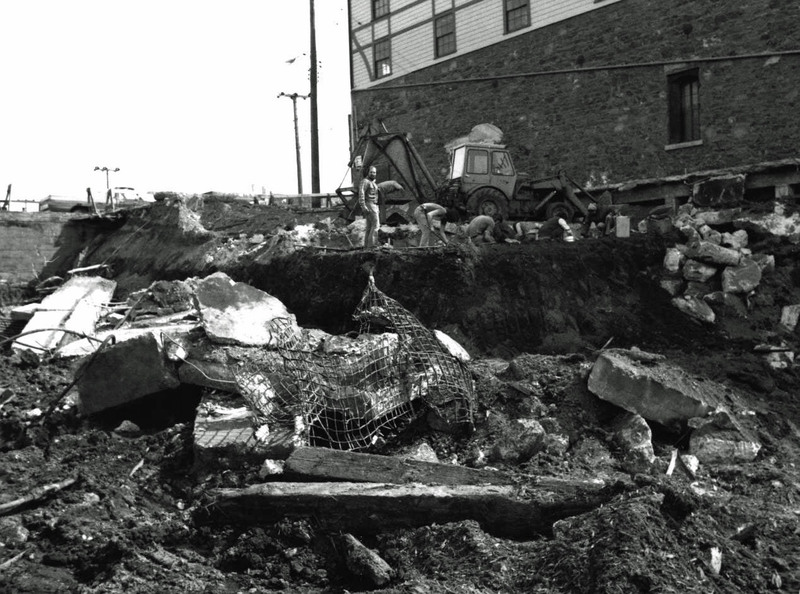 Large amounts of land fill were dumped in the area, especially toward Government Street where bottle diggers, during the 1960’s and early 1970s, uncovered large amounts of refuge that came from the Brewery site on the other side of Government Street. Figure 37. 1957 Fire Map.